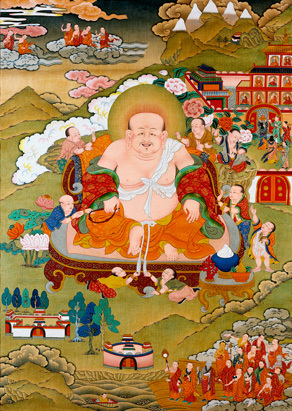 An iconographic thangka depiction of Moheyan is held in the Southern Alleghenies Museum of Art (SAMA) collection, St. Francis College, Loretto, Pennsylvania. Gift of Mr. and Mrs. John C. Rezk. Hva-shan is one of the two religious supporters who accompanies the sixteen arhats. His name is a Tibetan transliteration of the Chinese, he-shang, or "monk." 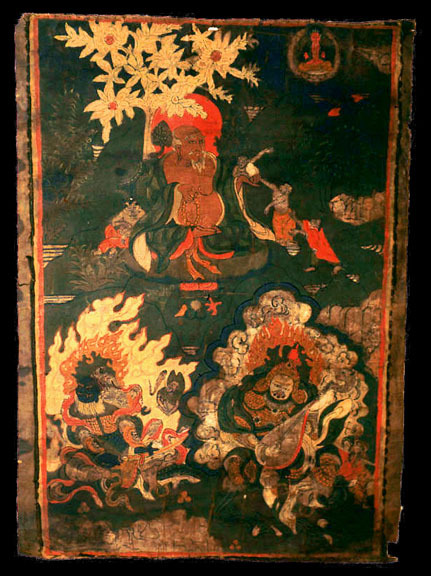 Hva-shan is thought to have been the monk who supported the Chinese Chan (Zen) position of "sudden enlightenment" at the ninth century Council of Lhasa, a debate between Tantric and Chan forms of Buddhism. Hva-shan is commonly revered as a friend and protector of children. Two armor-clad lguardian kings, Virudhaka and Dhritarashtra, and the red Amitayus/Amitabha are also shown in the painting. (Biblothèque de l'Institute des Hautes Études Chinoises, Vol. VII). Paris: Presses Universitaires der France, 1952. JIATS , no. 2 (August 2006): pp. 1-32. This article looks at local ritual and other transformations in the shifting meanings of the well-known Sino-Tibetan historical figure known as Hwa shang in the context of the multi-ethnic borderland of present-day Amdo. Hwa shang is usually represented in Tibetan masked dances and in Tibetan art as the representative par excellence of Chinese Buddhism. The different (hi)stories of Hwa shang and their multiple meanings in various contexts and for specific groups of people referred to in this article will show how decisive local and historical contextualization is for an understanding of seemingly uniform symbols, and for one that is more closely grounded in the specific realities and interpretations of ever changing socio-political worlds. 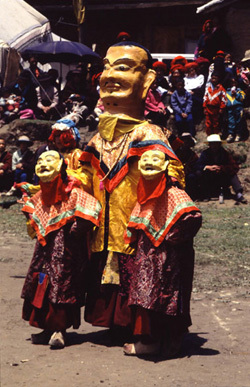 Hwa shang and attendants in the Rinpung ritual dance. Hwa shang has the largest mask in the ritual dance and moves slowly and gracefully around the dance ground, more like an observer than a participant. He is accompanied on his rounds by two small, masked monk attendants. R.A. Stein's “Sudden Illumination or Simultaneous Comprehension: Remarks on Chinese and Tibetan Terminology,” In: Sudden and Gradual: Approaches to Enlightenment in Chinese Thought, ed, by Peter N. Gregory, University of Hawaii, Kuroda Institute, 1987, pp. 41-65. Jeffrey L. Broughton “Early Ch'an Schools of Tibet,” in: Studies in Ch'an and Hua-yan, edited by Robert M. Gimello and Peter N. Gregory. The Kuroda Institute: Studies in East Asian Buddhism No. 1. Honolulu: University of Hawaii Press, 1983. A summary of research on the Ch'an from Szechwan that influenced Tibet in the 750s to 780s A.D. The Ching-chung Ch'an of the Korean monk Mu-sang (Wu-hsiang) was the first to reach Tibet. It was soon followed by the competing Ch'an of the Pao-t'ang "school" of Wu-chu. Therefore when the Nothern Ch'an master Mo-ho-yen arrived in Tibet, he had to compromise with Pao-t'ang doctrine and adopt some of its pseudo-history in order to gain a hearing among the Ch'an followers he was asked to represent. There is also some discussion of a third Ch'an lineage in Tibet, a Pure Land-style Ch'an. The article concludes with hints for further research which may reveal the contribution Ch'an made to the rDzogs-chen "school" which preserves many Ch'an works in Tibetan translation. Gómez, Luis O. “Purifying Gold: The Metaphor of Effort and Intuition in Buddhist Thought and Practice,” In: Sudden and Gradual: Approaches to Enlightenment in Chinese Thought, ed, by Peter N. Gregory, University of Hawaii, Kuroda Institute, 1987, pp. 67-167. Gómez, Luis O. "Indian Materials on the Doctrine of Sudden Enlightenment". In: Lai, Whalen, and Lewis R. Lancaster, eds. Early Ch'an in China and Tibet. Berkeley, CA: Asian Humanities Press, 1983. Gómez, Luis. “The Direct and Gradual Approaches of Zen Master Mahāyāna: Fragments of the Teachings of Moheyan,” in Studies in Ch'an and Hua-yen, edited by Gimello and Gregory, The Kuroda Institute: Studies in East Asian Buddhism No. 1. Honolulu: University of Hawaii Press, 1983. pp. 393–434. Edits and translates the sayings and works preserved in Tibetan in scattered fragments of the Ch'an master Mo-ho-yen, who took part in a dispute between Chinese Ch'an teachers and Indian Madhyamika teachers in Tibet in the last half of the eighth century. An attempt is made to reconstruct the original texts and sort them into five genres. Not all the fragments attributed to Mo-ho-yen are included. In the analysis of the texts, the author suggests that Mo-ho-yen's doctrinal position was that of an extreme non-dualist who thought practice came after enlightenment. Consequently Mo-ho-yen denied the value of means to that enlightenment, yet he still had to allow for a means for people of lesser abilities. This admission probably gave his opponents grounds for criticism. "Being and knowing in wholeness Chinese Chan, Tibetan Dzogchen, and the logic of immediacy in contemplation." Doctoral Thesis, Rice University. 2010. 348 pp. Responding to onto-theology, Eliot Deutsch proposes the idea of "knowing religiously," stating "religious knowledge doesn't so much have a distinctive or special object as it has a unique style or manner...a reverential knowing that is centered in reality." Based on the teachings of Chinese Chan and Tibetan Dzogchen, this dissertation builds upon Deutsch's premise to investigate the mechanism of 'im-mediate' knowing, or the logic of immediacy, in contemplation and philosophical expression. In particular, this dissertation shows that the meaning of one's being lies in spontaneous self-or-open awareness rather than in a highest being or transcendental divinity. Similar to Maurice Merleau-Ponty's "question-knowing," this open awareness has "an original manner of aiming at something," for it inspires one to embrace all but reify none. With this non-reifying-yet-all-embracing awareness, one's relationship with Being is embodied in a nondual dynamic, in which one unfolds being and knowing in wholeness. This holistic relationship is the insight derived from the logic of immediacy. It also provides an alternative paradigm to explore the nature of religious knowledge. This dissertation also shows that the logic of immediacy does not reject nominal intermediaries. Rather, it employs them in specific ways so that immediacy is realized without the dualistic bondages and conceptual limitations implied by methods of mediation. As this understanding is seen via a contemplative perspective, it offers an alternative to the sociopolitical perspective in extending our reach beyond the sectarian and the historical so that we can better appreciate the nuances of the teachings and the values of religious developments. Since the complex set of theses regarding the experience and thematization of immediacy emerges over time and in conversation with thinkers from different quarters of the religious-philosophizing spectrum, the narration of this dissertation starts with an origin narrative and an exemplar of the logic of immediacy in Chan Following the footsteps of Chan monks westwards, it delves into the development and teachings of sTon mun, a tradition of encounter between Chinese Chan monks and Tibetan tantric practitioners. 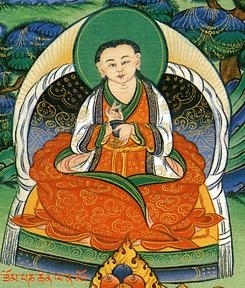 It concludes this tracing of the logic of immediacy with the early teachings of Dzogchen which emphasizes spontaneity. Kathmandu University, 2015, 94 p.
"The Conjunction of Chinese Chan and Tibetan rDzogs chen Thought: Reflections on the Tibetan Dunhuang Manuscripts IOL Tib J 689-1 and PT 699,"
in: Contributions to the Cultural History of Early Tibet, edited by Matthew T. Kapstein and Brandon Dotson, Brill: Leiden/Boston, 2007. pp. 239-301. PDF: "The Unifying of Rdzogs Pa Chen Po and Ch'an"
Chung-Hwa Buddhist Journal, Vol. 3, No. 4. 1990. pp. 301-317. PDF: "No-Thought in Pao T'ang Ch'an & Early Ati-yoga"
JIABS, Vol. 8. No. 2. 1985. pp. 61-73.